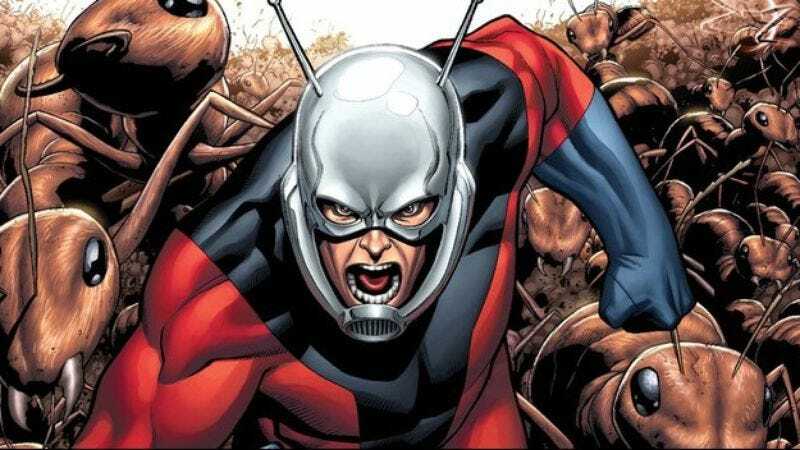 Perhaps to make up for the years in which it languished in frustrating development, Ant-Man has been moved up several months, according to Entertainment Weekly. Disney/Marvel will now release the Edgar Wright-directed film (which has still yet to be cast) on July 31, 2015, rather than its originally scheduled date in November. This will move it out of the way of The Hunger Games: Mockingjay, Part II, the new James Bond film, and, if the rumors can be believed, maybe even Disney’s own Star Wars: Episode VII that December. Of course, it also puts Ant-Man in the same summer season as a ton of other superhero movies—including Disney’s other big Marvel movie, Avengers: Age Of Ultron, opening May 1—and pits it directly against Batman Vs. Superman, opening July 17. Finally, it’s the long-awaited, oft-debated showdown between superhero saturation and audience fatigue—a contest that, honestly, will probably still see these blockbusters crush any sense of flagging enthusiasm, as easily as Superman would just step on the ant guy.